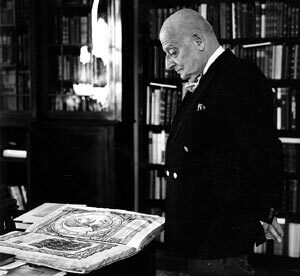 Any short list of the greatest antiquarian booksellers of the twentieth century would have to include the Breslauers, father and son. Martin Breslauer set up shop in Berlin in 1898 and soon acquired a European-wide reputation as one of the most erudite bibliographers in the trade. The range of his catalogues and the quality of his stock continue to astound today. He made numerous literary discoveries, while the important collections he brought to light included the vast Stolberg-Wernigerode library and the books belonging to Napoleon and his second wife, Marie Louise, which lay forgotten in a Viennese palace. In order to make his family's escape from Nazi Germany financially possible, Martin Breslauer was forced to sell two thirds of his matchless reference library. This loss of the firm's collection profoundly marked the son, then eighteen and barely out of school. Bernd Hartmut, later Bernard, was born in 1918 and a published poet in his teens, whose literary talents were recognized by the famous Austrian novelist and collector of autograph manuscripts and music, Stefan Zweig. After his father died in 1940 as the result of a heart attack brought on by a direct hit during the Blitz on the Bloomsbury mansion block in London where the Breslauers lived, and after having served for more than four years as a volunteer in the Alien Pioneer Corps of the British Army, Bernard slowly but brilliantly revived the fortunes of his father's company. He was a keener businessman than Martin had been and in several fields also became the greater expert, notably on historical and artistic bookbindings. As he began to advise more collectors, gaining their confidence with his connoisseurship, energy and enviable memory, Bernard Breslauer's prosperity grew. In 1977 he moved to New York. His great achievements as a rare bookseller, specializing in European manuscripts, early printed books and fine bindings, and as a collector of manuscript illuminations and historical bibliography, have formed the subjects of a number of articles, memoirs and lectures, as well as several exhibitions in the United States (including a major one at the Morgan Library & Museum) and abroad. The purchase on behalf of the Württembergische Landesbibliothek in Stuttgart of the General Theological Seminary Library copy of the Gutenberg Bible at Christie's in 1978, for the then world-record hammer price of two million dollars, perhaps marked his finest hour. He also published numerous articles on bibliography and bibliophily, and his monograph, Count Heinrich IV zu Castel (1978), is an important contribution to the history of Renaissance book collecting. An honorary degree, doctorate of letters, was conferred on him by the Free University of Berlin, in recognition of his contributions to bibliographical scholarship. In the last ten years of his life Bernard Breslauer had more or less retired from the trade, but his collecting never flagged. Important acquisitions, which he was always keen to show friends with disarming pride, were made almost until the end. He also maintained a lively interest in the fortunes and misfortunes of booksellers, collectors and libraries. No American or European antiquarian booksellers, with the exception of Dr. A.S.W. Rosenbach and Lathrop C. Harper in the United States and Commendatore Tammaro de Marinis in Italy, have been as generous to libraries as Dr. Breslauer. To the University of California at Los Angeles he provided for the establishment of an endowment to fund a professorship in bibliography. And to the Houghton Library at Harvard and the American Trust for the British Library he provided substantial amounts in his will, to establish endowments for the purpose of acquiring rare books and manuscripts. After those amazingly generous gifts and some private bequests, he willed his residual estate to the B.H. Breslauer Foundation, which he had formed before his death and whose directors he had chosen.